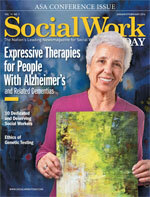 Social workers bring real change to communities and tremendously impact people’s lives. Yet those efforts frequently go without the recognition they deserve. Each year, Social Work Today provides a forum for our readers to nominate social workers who they believe deserve recognition for their dedication to the profession. We know that many of you merit more credit than you’re given, and it’s never an easy task to select only 10 finalists. We’re honored to share their stories with you here. While some may say that coming from a privileged background can lead to a sense of entitlement, that wasn’t the case for Ryan Lindsay. Instead, he became acutely aware that others didn’t have access to the same opportunities he did. That realization drove him to pursue a career in one of the helping professions. When back in Missouri for work, Lindsay found that the state lagged in the quality and variety of mental health services available, particularly for the most vulnerable. “I see a big gap in being able to deliver extremely high-quality, evidence-based services to those who need it most,” he says. “There was an opportunity to serve those who really needed access to services, and that inspires me.” So Lindsay, along with Nancy D. Spargo, AM, LCSW, founded the St. Louis Center for Family Development to fill the gap. The center offers trauma-informed services and evidence-based treatments to underserved families and communities. In the 25-plus years that Michelle Villeneuve has been a social worker, she’s seen a lot of change. But many of the biggest changes have come recently. In the nine years since she started at her current post, working with individuals with issues related to substance abuse and other mental health diagnoses, Villeneuve says popping pills has become the biggest problem area, as young people are becoming addicted to pain medications after surgery, for instance. She says one of the hardest parts of her job is witnessing relapse and seeing the same patients come back through the door. Although she began as an engineering major and spent more than a decade practicing civil engineering, Jodi Helbert never felt that she was fulfilling her true passion. More than 10 years after graduating with her engineering degree, Helbert went back to college and got the social work degree she believes she was meant to have. Within the community, Helbert has served on several boards and within various organizations over the years. Currently, she serves at the Crisis Center, which helps people who are suicidal or deeply depressed. “Because of my background in grant writing, I’ve been able to help find funding, which has been very fulfilling,” she says. For her many efforts, Helbert was appointed Kentucky colonel by the state governor, honoring the extensive community outreach and civic services she has performed. Catherine Harris Small says her adoptive mother went to great lengths to teach Small and her brother (also adopted) to unconditionally accept others, inspiring Small’s desire to serve at a young age. When she was in middle school, she started as a candy striper at the local hospital, where she worked double shifts. Though Small admits she sometimes felt awkward and like an outsider in her middle school years, she enjoyed a real sense of reward when volunteering, and she loved helping others. Her experiences ultimately were instrumental in her career as a middle school guidance counselor. With the community’s help, Small was able to ensure that the youths in Spirit Paws could go to a formal banquet held at the end of the season. Local businesses donated everything from the tux rentals to the flowers and the dresses. Before getting into the school system, Hutcherson worked in child welfare and independent living programs as well as in the nonprofit sector. But as a school social worker, she believes that she’s helping to fill a gap for mental health services that is strongly needed within the school system. Her caseload is heavy: She services two schools and about 78 students and deals with issues that arise when there’s a traumatic event. Now as a mother herself, Lindley hopes to pass down this influence to the next generation. For instance, if she checks on a neighbor or shovels a driveway, she involves her kids. “There’s no greater compliment to me than when someone tells me my children are kind,” she says. Growing up, Gale Logan-Mullings thought she’d be a teacher one day. While she pursued a degree in psychology in college, social work eventually became her destined path. It was the opportunities to work in multiple fields and the potential to work with diverse populations that attracted her to the profession. “Since obtaining my master’s degree from NYU in 1998, I have worked in foster care, forensic, and medical social work with children and families, adults, and geriatric populations from various cultural and socioeconomic backgrounds,” she says. Since his time in the guard, Munson has held various teaching posts and worked in private practice, teaching at all levels of social work education along the way. He estimates that he has taught nearly 10,000 students in his lifetime. In addition to teaching, he has authored several texts, is the founding editor of the journal The Clinical Supervisor, and was the clinician in a precedent-setting Maryland Court of Appeals case that affirmed the right of licensed clinical social workers to perform DSM-IV-TR diagnosis and to testify as experts—a case that has had national implications for the field. But Munson says one of his biggest concerns about social work is the “manualization” of the field. “Having everything come out of a manual and producing very set and rigid ways for how we do things is not sufficient,” he says. “Social work is losing its identity if we become individuals that only operate from a manual. There has to be a place for the social worker who is still willing to sit and listen to people and hear what they have to say. We often underestimate how powerful that can be in curing and in helping.” That’s one takeaway point Munson hopes his students will carry with them and apply in practice. Five years after earning her MSW, while working with adolescents and adults, Lea Pipes was presented with an opportunity to direct the social service department for the Motion Picture & Television Fund in 1981. At the time, the entertainment industry was reeling from a workforce strike, with many people experiencing financial and personal crises. The fund responded through social services with counseling, information, referrals, and emergency financial assistance. Since that time, Pipes has worked her way up through the organization to her current position overseeing a team of more than 25 social work managers and support staff and reporting directly to the CEO and board of trustees. In her position, Pipes oversees community services for adults and elders, including planning, developing, and administering social work and community-based programs. Charitable services also are a key component of the mission. This mother of two has demonstrated that social workers can hold office in top management positions and make a difference in the lives of others. Pipes also is active in professional organizations and currently serves as a secretary for Leading Age California. After her MSW, Pipes earned a certificate in gerontology from UCLA and has a special interest in the aging population. She is the 2008 Aging Services of California Meritorious Service Award recipient and the Motion Picture & Television Fund organization recipient of the Aging Services of California 2009 Community Services Award. She also has been a guest speaker at conferences throughout the country.